Services and Fees - Greenbaum P.C. Patent Prosecution: The term "patent prosecution" refers to the process by which an inventor obtains a patent. At Greenbaum PC we offer various innovative methods to streamline the prosecution process and draft patents with the broadest possible protection. Trademark Prosecution: Trademark prosecution is the process by which entities register their trademark with the United States Patent and Trademark office. Federal registration of trademarks confers various benefits including a presumption of the right-to-use and the right to sue in federal court. Trade Secret Practice: Trade secret law is a complex and rapidly evolving field of law. In order to ensure protection of trade secrets, Greenbaum PC works with each of its clients to establish and monitor secrecy policies. Copyright Practice: Copyrights are legal rights given to the Authors of artistic works. No federal registration is necessary for the perfection of copyrights, but careful monitoring is critical for asset protection and loss prevention. 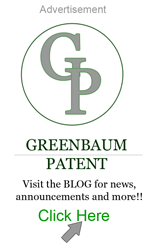 Licensing and Litigation: Obtaining IP is just half of what we do at Greenbaum PC. The other half is working with our clients to generate value from their IP, and then protect that value. We work carefully with each of our clients to generate opportunities for licensing revenue. We are also available for IP litigation.